Ah, the Big Apple—it’s a place with endless opportunities, razzle-dazzle, and arts and culture. But let’s face it: everyone needs a break from the city every once in a while. Luckily, New York City is close to the Hudson River, the Moose River, and the Black River, all great spots for whitewater rafting trips. The Upper Hudson River Gorge is a 17-mile stretch of river located in the Adirondack Mountains—a welcome respite from city life. Though the drive time makes this trip a bit out of reach for a day trip for many people (three and a half hours from New York City), there are several options for lodging in nearby Warrensburg, NY. The flows on this river can vary with seasonal fluctuations; most outfitters suggest a minimum age of 14 during the high water months of April and May, though that age may be lowered during other months of the season. Families with younger children can consider rafting the Middle Gorge, a seven mile, half-day adventure suitable for participants aged eight and up. Rafters will love the fantastic mix of exhilarating whitewater and pristine scenery. Consider a fall trip to experience the gorgeous New England foliage! 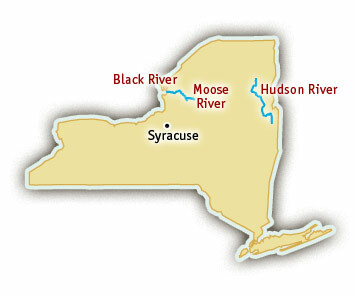 The Lower Moose River is considered New York’s best, most challenging whitewater! During the peak spring runoff, the Lower Moose River offers a thrilling 13-mile run through Class IV–V rapids. The features here are so big that many outfitters require participants be at least 18 years of age and have previous whitewater experience. Trips are also available on the Middle Moose, a half-day, Class I–III run. The Moose River winds through rural New York counties…when you’re not busy paddling, you’ll definitely enjoy the scenery! Trips start near the town of Old Forge, NY, a five-hour drive from New York City. The Black River is another option for weekend whitewater trips, and offers a great break from the city. Trips start near the town of Watertown, NY, a five-hour drive from New York City. Rafters travel down seven miles of river packed with whitewater features. During the high water spring months, this river is Class IV–V: nonstop adventure! Most outfitters suggest a minimum age of 14 during the spring months. When the water slows down in the summer, the Black River is great for family trips. The rapids quiet down to Class III and the river is suitable for ages eight and up. This river is known for its perfectly swimmable warm water, lush scenery, and narrow rock gorges.